2013 SUMMER SPECIALS – COMING SOON!!! for LATISSE – BEAUTY NIGHTS ONLY! and abdomen. Book your appointment now. Raffles for discounts & gift cards! Please call 1-800-IMAGE-2011 for further information. Surgical procedure to correct loose, sagging skin of the abdomen. Also corrects weakened or separated abdominal muscles due to weight loss, pregnancy and aging. This surgical procedure is designed to correct excess skin, tissue and fat that contribute to puffiness and bags in the upper and lower eyelids. Surgical procedure to correct loose, hanging skin of the upper arms. This procedure is usually performed in conjunction with liposuction. Surgical procedure to enlarge and reshape the breasts. This procedure is also an excellent choice for women that have lost shape, size and fullness due to pregnancy, breast-feeding and weight loss. Women who have experienced a loss of shape and firmness of their breasts may benefit from the breast lift procedure, also called mastopexy. These changes in breast contour usually include a loss of skin elasticity resulting from significant weight loss, pregnancy, breast-feeding, aging or genetics. This procedure is designed to restore the firmness and shape of the breasts by removing excess skin and tissue to create a new breast contour. In some cases this procedure is performing in conjunction with breast implants. Women with large breasts can experience more than image dissatisfaction, they may experience pain and discomfort. If you have overly large breasts that limit your physical activities then the reduction procedure may be right for you. Male patients may also desire breast reduction for a condition known as gynecomastia. Depending on your individual body type, there are several variations to the breast reduction procedure. These include a variation in incisions to liposuction. If excess skin is not an issue then liposuction alone may be all that is required to reduce the size and weight of your breasts. Breast reconstruction is performed to correct a variety of breast deformities. Most reconstructive procedures are customized to your specific circumstances and usually involve the use of breast implants. Some patients require breast reconstruction due to congenital deformities or breast asymmetry, while others require reconstruction from previous breast surgery including breast mastectomy. Loss of skin elasticity and firmness with sagging skin and wrinkles are visual signs of facial aging. The facelift procedure corrects sagging skin and muscles and restores firmness to create a more youthful appearance. If you are bothered by excess fat deposits located anywhere on you body, that do not respond to exercise and diet, this procedure may provide the answer. Liposuction is a surgical procedure to remove localized fat deposits and to reshape and contour specific areas of the body. Liposuction is not a treatment for obesity. The body lift procedures are performed to correct excess loose and sagging skin of the abdominal areas, buttocks, lower back, groin and thighs. There are several factors that contribute to poor elasticity of the skin including sun damage, aging, pregnancy, significant changes in weight, genetics and hormones. These procedures may be used in conjunction with liposuction to achieve the best results. Cosmetic surgery of the nose is a procedure to improve the appearance of the nose in relation to other facial features. When your nose is out of proportion with the rest of your face, it can affect your self-confidence and self-image. This procedure is strictly for change in nasal appearance, not for breathing or sinus problems. 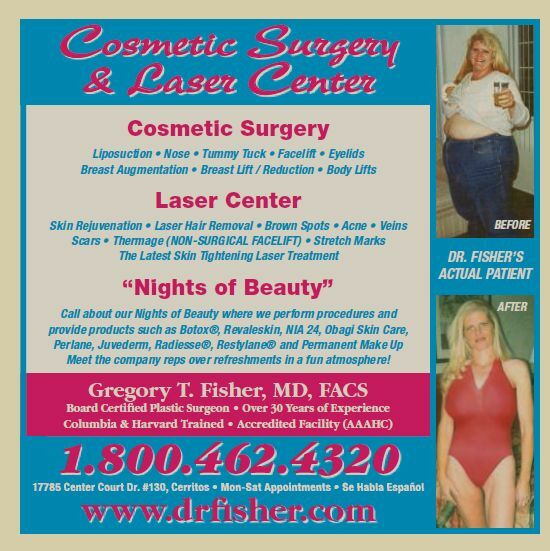 Examples of Dr. Fisher’s work with hand and micro-surgical reconstruction.